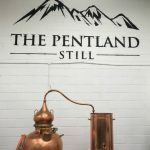 Nestled behind an Edinburgh brewery you’ll find the Pentland Still Company, founded by Sandy Morrison in 2017. Sandy’s job description is long – founder, distiller, forager and everything else that goes with making a hand-crafted gin. The day I met Sandy his father was happily filling the beautiful bottles by hand, with Madonna providing the soundtrack. I should say, I don’t think this was intentional, more what was playing on the radio! distillery, producing what is now Batch #2. King’s Hill encapsulates Sandy’s love of gin, hiking and the Pentland Hills where he gathers rosehips, elderflower, heather and gorse. What started as a hobby, like many of the gin producers we meet, is now a new and exciting gin brand. The name comes from a local legend – Sandy stumbled upon a grave when he was out walking, and it piqued his interest, so he set about doing some research. What he found was there was a wager set by the recently returned King Robert the Bruce. King Robert the Bruce, stood upon this hill to witness the outcome of a bet with a fellow nobleman, Sir William “The Crusader” Sinclair of Roslin. The wager – catch the elusive white Pentland Stag. The stakes – The King’s Pentland Estate…against Sinclair’s head. Sinclair was victorious, saved only by the fleetness of his hounds Help & Hold, and named the hillside in the King’s honour. 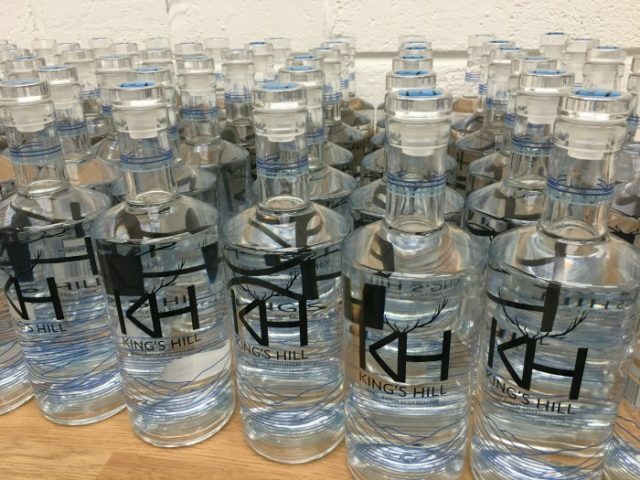 So, it only seems fitting that Sandy has now made a gin fit for a King, or at the very least all us lucky folk. One the finish: berry sweetness, with hints of liquorice, yet cooling. Orris root, lemongrass, elderflower, liquorice, rosehips, gorse flower, heather, angelica, orange peel, coriander and cassia bark. This gin has a beautiful bottle and makes that lovely sound you can only get from a glass stopper. 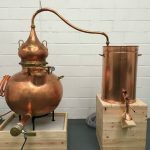 The gin stands up to the bottle, this is not style over substance, it is a fantastic refreshing gin and one which would appeal to most – this is a positive in a world where some recipes are a bit Marmite. We tried it served with Mediterranean tonic and pink grapefruit on Sandy’s recommendation and it worked a treat. So much so, we had to have another one. We also decided to try it with Cushiedoos, a new tonic from Scotland, that uses Scottish water, Scottish botanicals and British sugar beet. There’s no quinine, artificial sweeteners, or preservatives, and it has 24% less sugar than the leading premium tonic. But back to the gin – this was a taste sensation and complemented King’s Hill perfectly (in my opinion) this pairing enhanced the floral notes of the gin without overpowering it. The great thing about gin is there is no one way to enjoy it – I always say drink it your way, unless it is with Lilt, but that’s another story.